Check out Groove's latest partner interview with Ben Congleton, CEO & Co-founder of Olark Live Chat, to learn about the story behind Olark and what’s in store with their product offerings as we push forward in 2014. One of my favorite features on eCommerce websites (and even lead gen websites) these days is online chat. I absolutely love it and have even written about it in my past blog, "5 Third Party Tools for Reducing Shopping Cart Abandonment." In my mind, there’s simply no better way for businesses to personalize and improve their customer service experience for web visitors online. Now, if you’ve researched popular online chat tools within the past few years, odds are you’ve come across a company called Olark. While I first met these guys in-person at Magento’s Imagine 2013 conference, I was already extremely familiar with their main product and had used it with a few clients here at Groove. My take? 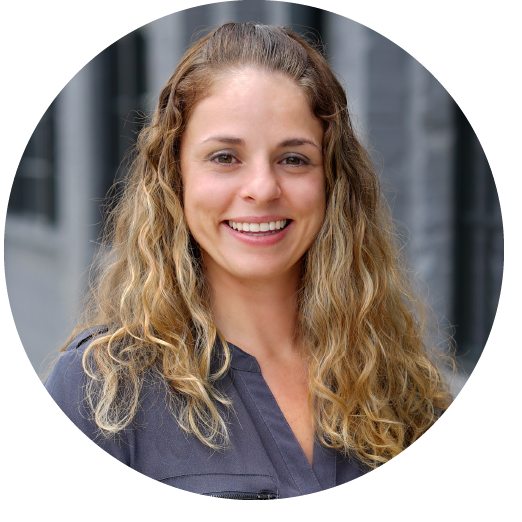 It was super easy to setup, it had great customizations, it was affordable, and, most importantly, it had a positive impact on conversion rate immediately across the board for each of my clients. Because I’ve had such a positive experience with Olark, I decided to sit down with Co-founder and CEO, Ben Congleton, and learn more about the story behind Olark and what’s in store with their product offerings as we push forward in 2014. Enjoy! 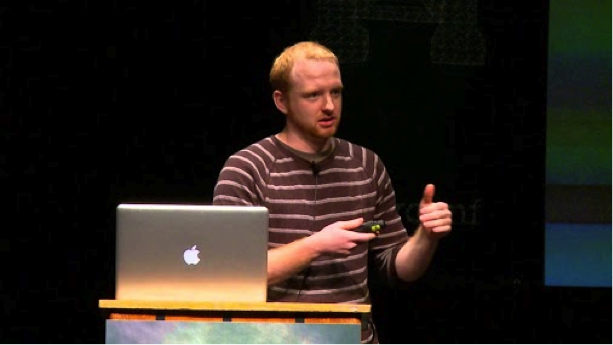 Ben, pictured above, believes that companies exist to serve customers, and build software that does just that. Q. How would you describe Olark in an elevator pitch? Olark is the small ‘click to chat’ tab found along the bottom of websites. It’s the easiest way to talk to customers while they’re shopping or browsing your site - to answer their questions, provide a smooth buying experience, and turn window shoppers into happy customers. Q. How was the idea of Olark born? In the late 90s, I co-founded a web hosting company with some friends. We used instant messaging clients to talk to each other, and wanted a way to connect instantly with our customers too. We looked around for solutions and finally found live chat software that was built for call centers, but not really small teams like us. The software was clunky, but it was so valuable that we committed to using it. Live chat became essential to the growth of our business. It allowed us to connect with our customers, explain our value proposition, and make the sale. Live chat was really valuable, but we suffered through software that didn’t really meet our needs. At that time, almost all chat platforms were built for giant call centers. We ended up paying a lot of money for a solution that didn’t really fit our needs. Ten years later, we realized that there was an enormous opportunity to build a beautiful, easy-to-use product that felt and operated more like the chat we were using to talk to our friends online, like GTalk. Our hope was that by making live chat easier to use, we could unlock the value of talking directly to your customers for every business that sold online. Q. Why do you feel online chat is so important for eCommerce? Commerce is about relationships. Both online and off, your relationship with your shoppers determines whether you succeed or fail. Live chat provides a simple way for storeowners to relate to their customers, both by answering their questions, and taking the time to learn more about the people who are purchasing your goods or services. A lot of business owners spend a lot of money driving traffic to their websites. 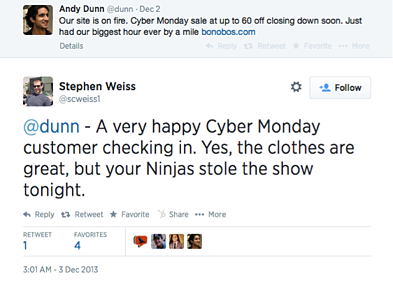 Live chat is the most direct way to talk to those customers once they arrive. With live chat, customers don’t have to break away from browsing to make a phone call, or wait for an email response to their questions. They can continue shopping and get information immediately. This helps businesses instill confidence in their customers that they’re making an informed decision when the time comes to checkout. Bottom line: in an age when customers expect quick solutions to their questions, tools like live chat let brands meet those expectations and provide that instant gratification that comes with an online experience. Q. What's your favorite feature of Olark? We invented on page chat: a floating chat box that allows visitors to chat in a floating chat box while browsing a website, rather than having to switch between a site and a pop-up window. We literally changed the way people expect to chat with companies, and made it so much easier for customers to chat while shopping. Our Targeted Chat is pretty neat too =). For eCommerce storeowners on Magento and Shopify, our CartSaver feature is pretty great too. With CartSaver, you can watch your customers shop in real-time, and every time you talk to a shopper you can see all items in their cart and their cart balance. Cartsaver brings context that makes you much more efficient at serving your customers. Q. How many clients do you guys serve at the time of this interview? We are growing fast; we currently we have more than 9,000 paying customers. We also have tens of thousands of businesses using our free plans. Q. Any particular case studies that you like to highlight? This made my day. On the busiest online shopping day of the year, the head of one of the busiest retail outlets said that chat was the story of the year. Also to see that positive customer feedback from a happy customer - that’s what we’re all about: helping our clients and partners make their customers happy. I always like to read about our customers using metrics to verify the success of Olark. Visual Website Optimizer ran a study where they found that an Olark chat widget increased a customer’s performance by 31%. A few years back, we ran a big study with Shopify where we looked at Olark’s usage across hundreds of stores and thousands of orders. We found that people who chatted before buying on average spent 30% percent more, and were 3 times more likely to come back and shop at the same vendor than the typical purchaser. 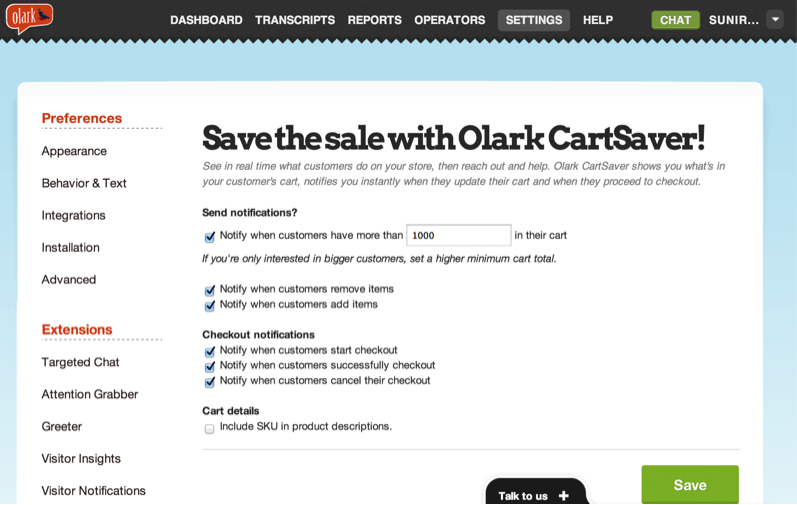 In short, Olark [in my humble opinion] just works for eCommerce. Q. Back in April, you launched "All Hands Support" month. Can you talk about what that entailed? 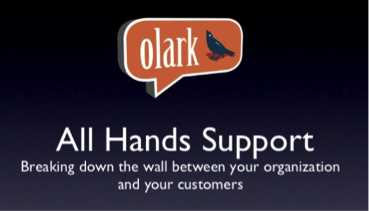 When we we just starting Olark we started a customer service department to be the interface to our customers. We no longer had to deal with customer inquiries, but our customer insight became mediated by our customer service department. We started losing touch with our customers, devaluing our support team, and under-prioritizing features that would have reduced support. This was bad. We had to address this problem. We wanted to make customer service encoded into our organizational DNA, not just a role at our company. We started having every member of the Olark team do rotations on customer service as a way of spreading customer and product insight throughout the organization; we called this “All Hands Support”. What started as rotations for just us four founders, has scaled to over 30 Olarkers. As we’ve grown, we’ve noticed that by putting everyone on the front lines we not only focus our team around our customers, but also get faster product feedback, and more informed product contributions from across the team. This year, we wanted to bring the benefits of direct customer insight to others outside of Olark. We launched All Hands Support Month in April. During April, we shared stories of how our different employees and teams have directly benefited from All Hands Support, from Marketing to Customer Service to Engineering, and even me, our CEO. We also encouraged our customers to bring other departments in their organization on to chat, by letting them add as many chat operator seats as they wanted, free for the month of May. Q. What feedback have you seen so far with your target audience? We just published a great story that highlights All Hands Support in action. A Chicago-based company called GiveForward took advantage of the ability to upgrade to as many operators as they wanted for free. Of the 18 ‘non-support’ employees they invited to participate, 14 accepted and took time during the month to chat with customers. The entire company enjoyed it so much, they added an additional operator seat so anyone in the company can login to chat from time-to-time, and they are talking about recreating the experience again next year. You can read more about their story here. Q. Any other insights about what's in store for Olark moving forward this year and where chat is heading? There are still some exciting announcements coming up in the second half of 2014 =). Olark’s 5th birthday is right around the corner, and we’re continuing to follow-up on a lot of great conversations we had at IRCE (Internet Retailer Conference and Exhibition) while looking ahead to the Shop.org Summit. We are staying busy. We continue to focus on eCommerce retailers and software companies that sell online. We believe that every site on the Internet that sells online will have live chat. We want to empower these companies so they can provide a high quality experience to their customers and drive real business value. In particular, we think the focus on operational efficiency (handle times, time to first response) has hurt customer service’s ability to build relationships, make sales, and improve retention. Olark is going to help turn customer service teams into profit centers. #Wow. I really enjoyed Olark prior to chatting with Ben, but hearing their story and where the product is heading is truly inspiring. I speak for everyone on my team when I say that we’re continuing to be impressed by these guys and what they’re doing with online chat to positively impact user experiences online. Have any questions for Ben? You can contact Olark directly via email OR simply head over to their website and start a chat (the latter is encouraged). Of course, if you need a Magento Gold Solution partner to help you configure Olark and optimize it for your website, don’t hesitate to give Groove a shout!